Why did I call this “Incredible Garlic Shrimp”? 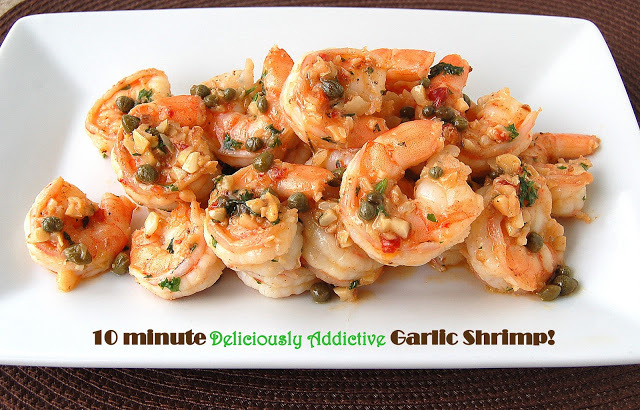 Well…maybe its because shrimp is a top 5 favorite food of mine and capers & garlic are in my top 10 ingredients. I don’t know…I just love this dish and if you like shrimp…I think you will too! Is it wrong that I often crave capers and eat them straight from the jar? Am I alone in this? Garlic Shrimp, Shrimp Scampi…what’s the difference…right? I think the only difference is the addition of white wine for scampi. I remember making Shrimp Scampi at a young age and loving it! Years ago I phased out the wine part of the dish and added in capers and now I have a favorite dish that I can make quickly whenever the mood strikes with ingredients I typically always have on hand! This is fantastic to make for a crowd or for 2. Simple yet impressive and completely addictive! Heat your olive oil in a large pan over med-high heat. Add in your garlic and saute for 30 seconds, add in your shrimp and saute for 1-2 minutes, lower the heat to medium, sprinkle with s&p, add in 3 chunks of butter & the lemon juice and continue to saute until cooked through (about 2 more minutes), turning occasionally to ensure an even cook. Remove from heat, add in your capers & juice, sprinkle with the red pepper and parsley and add in your remaining butter. Toss until the butter is melted and serve immediately. Notes: This is a fabulous appetizer as well as a great meal with a hunk of crusty bread and a salad or even some pasta. If you like Cilantro better than parsley, feel free to substitute. If you are not into capers (gasp! ), feel free to leave them out…but I wouldn’t lol! If you are cooking for a crown and this is an app…I would make 2 batches since it cooks up so fast. That way it stays nice and hot while your guests gobble it up! Bang-Bang Shrimp are my absolute fave! Will be "pinning" this!! This looks super yummy! I love capers.